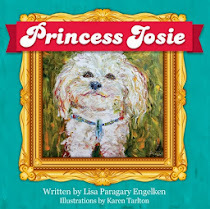 Take an Imaginary Adventure with a Royal Doggy … that is, Princess Josie, the delightful doggy who believes she is a princess. Explore her royal world as seen through Josie’s puppy eyes. This beautifully illustrated children’s picture book takes young readers into thecreative imagination of Josie, the beloved doggy who adores her family. Enjoyreading this unique and funny bedtime story to your children as Josie leads readers through her fanciful, imaginary world where she is the princess and herfamily the royal family. If you have young children, grandchildren, nieces or nephews or want to gifta friend’s children, this divine, richly illustrated children’s book guarantees toentertain. It features many beautifully hand-painted illustrations by Karen Tarlton that art lovers will also enjoy. For International or bulk purchases, by sending an email to info@3LPublishing.com or calling 916-300-8012. 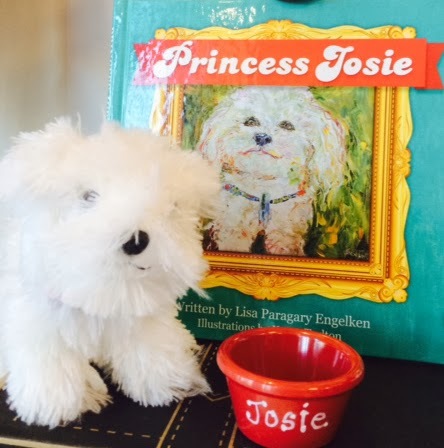 Buy the sweet, charming children's book Princess Josie and get a lovable plush puppy and red dog dish with Josie's name emblazoned on it. Your kids can read the book and enjoy their own Princess Josie toy. ©2015 Lisa Paragary Engelken. Powered by Blogger.